Husky PVC Air Hose is ideal for general purpose applications. It features a lightweight, durable design. Best for contractors and home users. Its bright florescent colour reduces changes of tripping while on a job site. Temperature range: 20F to +145F. The light weight of this polyurethane hose makes it ideal for applications where dragging a heavy hose is an issue like roofing. The smooth, non-marring finish also makes it ideal for indoor trim work where scratching surfaces could create damage. "Poly" hose has very good cold weather flexibility. Bend restrictors reduce kinking and increase the life of the hose. End fittings are field repairable, so with a knife and two wrenches a quick repair can be made to the hose if damaged. 300 psi Work Pressure. 100 feet long with 1/4 inch NPT end fittings. 4 Year Warranty. 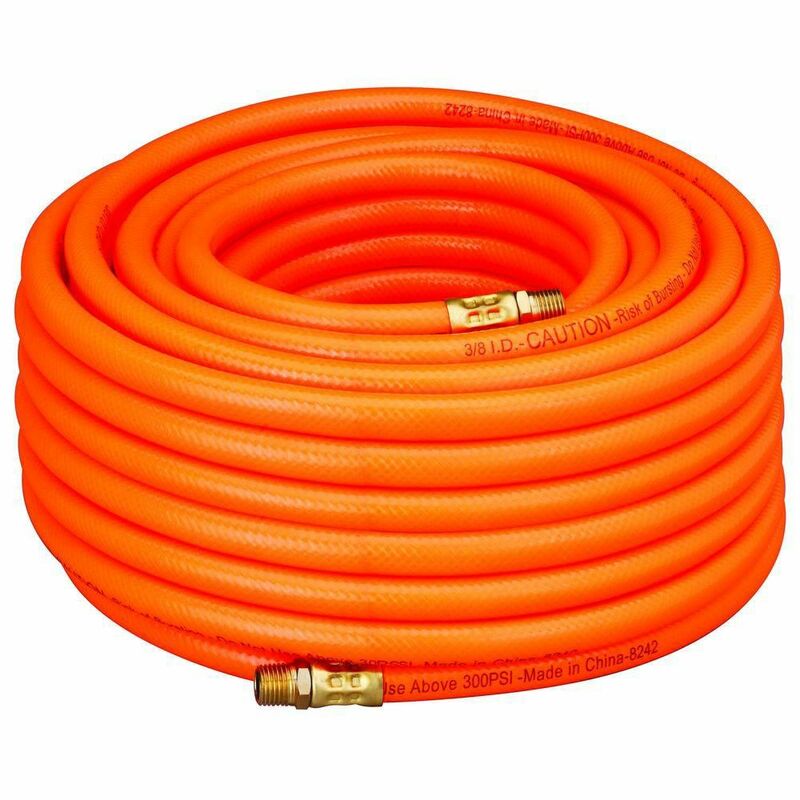 3/8 Inch x 100 Foot Orange PVC Air Hose Husky PVC Air Hose is ideal for general purpose applications. It features a lightweight, durable design. Best for contractors and home users. Its bright florescent colour reduces changes of tripping while on a job site. Temperature range: 20F to +145F.